Drinks and chats with artists, organisers, participants until 22:00. We cordially invite you to the final event of the four part collaborative project Survival Kit for Virtual Reality where we explored questions, issues and possibilities surrounding technology from an artistic point of view, though a hands on approach, experimenting in workshops with various technologies (Oculus Rift DK 2, Google Cardboard, 3D video production with GoPro cameras, cybernetics, biosensors, robotics). 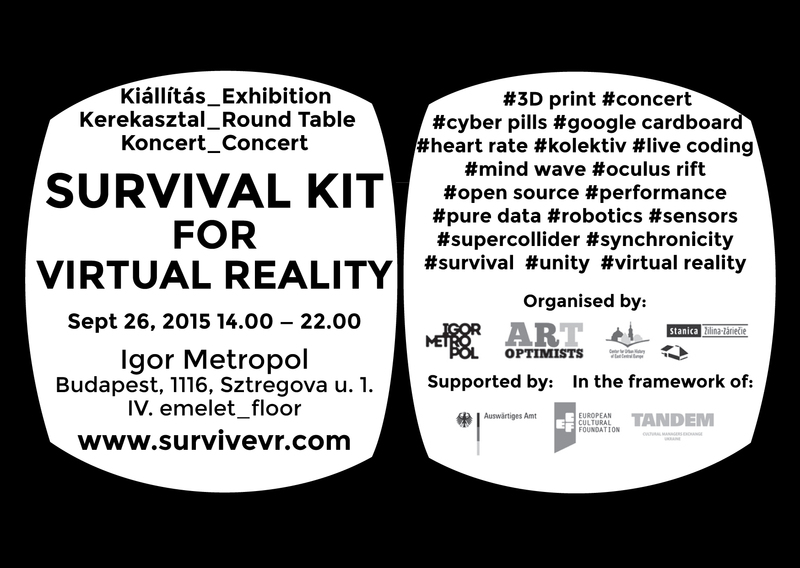 We invited artists, art students, IT specialists and game developers to participate, create and collaborate in the following three workshops: Survival Kit for Virtual Reality (Mykolajiv, Ukraine), Cyber Pills for Your Mental Health (Lviv, Ukraine) and Kolektiv / Live coding with biometrics (Zilina, Slovakia). Our aim is to use the experiences and results of these events on top of the know-how of invited facilitators, guests and participants to develop a methodology for art and technology education to think about and work on a vision of “a best practice” for such workshops. At the event you will have the opportunity to see our prototypes, experiment and documentation. You will be able to learn about our goals, ideas, plans and processes. Last but not least you can ask us questions, tell us your opinion and add to the debate surrounding these emerging technologies. This project is a part of TANDEM exchange program and a collaboration between non-profit organizations ART Optimists (Mykolajiv, Ukraine), Center for Urban Culture (Lviv, Ukraina), Truc spherique (Zilina, Slovákia) and Igor Metropol Association (Budapest, Hungary).